Cindy offers private consultations in your home, her home office, by phone, or wherever you need her, easing the burden of training for you. Behavior plans are science based, effective and will bring about your dog’s desired behavior. 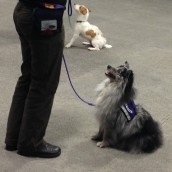 Cindy has the skills, experience and knowledge to help your dog become the dog you always wanted. Initial sessions begin with a consultation in your home, my office, or wherever you need me. We talk about your training goals, and develop an individual behavior plan designed especially for you and your dog. These initial consultations last from 2 to 2 1/2 hours. All sessions include training notes, handouts, follow up phone, email, text support and video's of session (if desired). Skype also available. Because of this, only one additional session may needed depending on the severity of the problem. More serious problems may require 1-6 sessions. Initial Sessions are approximately 2+ hours long. Additional sessions are approximately 60-90 minutes. Basic naughty dog $195 aprox. 2+hour. ADDITIONAL SESSIONS- $95. ($75 therapy and service) 60-90 minutes. * Mileage fees are applied outside of the Eugene, Springfield area. 2018 mileage fees are .55 cents a mile. ONLINE CONSULTATIONS Some consultations can be done on line through video calling/conferencing. Please contact me for more information or to see if your dog’s needs meet the criteria. On line consultations are done through video calling (Skype or Google Duo app, etc) Resources and handouts provided. While you’re away, don’t have time or just want your dog to play. I train your dog for you at your home, my office, or wherever you need me. We do trail training, meet and greets and more! To determine which program is suitable for you and your dog, an initial assessment by phone or email is required for all behavior programs and may include behavioral advice and/or referral to other services. Payments or payment arrangements are required before time of initial session. Any unused sessions can be refunded within 6 months of purchase. Other rates and schedules are established according to the individual behavior programs and needs of the client. We are happy to make trips to other locations in Oregon to help with your training needs! A travel fee will be added. Mileage fees for 2018 are 55 cents a mile. Click here for our cancellation/change policy.